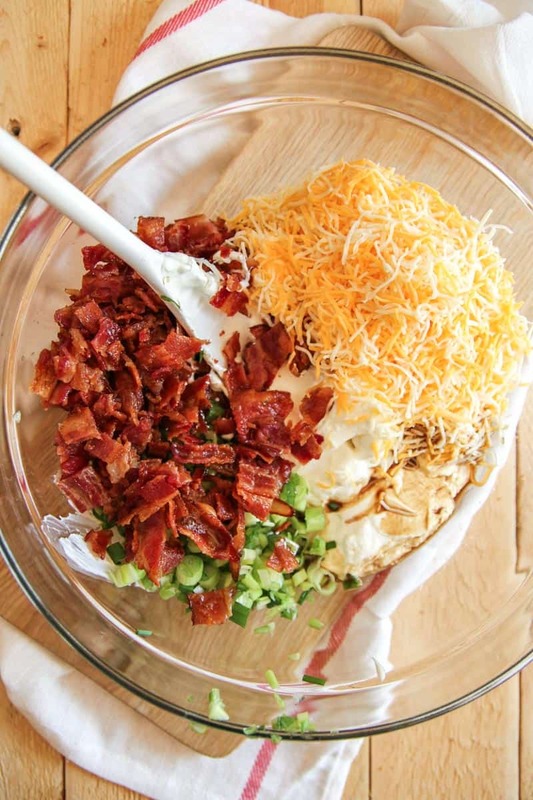 If there’s one dip you’re going to want to make to bring to parties, it’s this cheesy bacon dip. Simply put, it’s the best dip ever!! 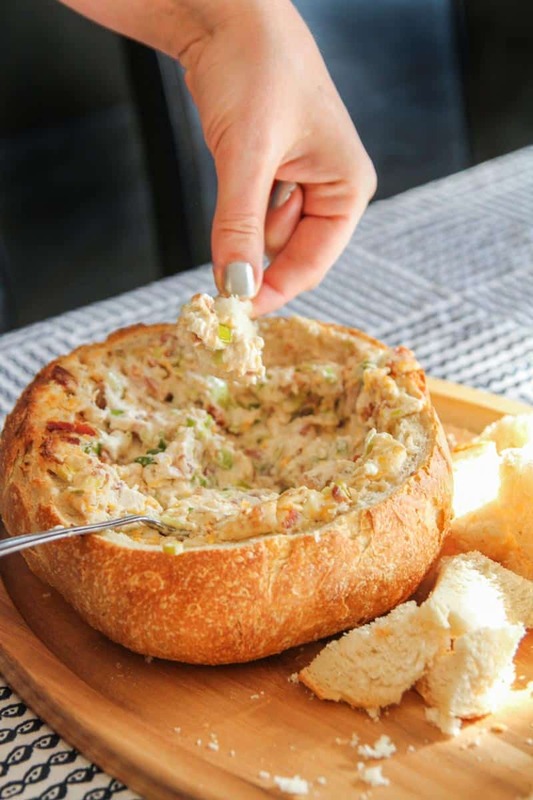 Let me tell you how I came across the recipe for this cheesy bacon dip: a few years ago when I was getting married, my amazing family/ in-laws threw me this bridal shower. As part of the invites they sent, they included a blank recipe card and asked everyone to bring a recipe to the shower and include it in a recipe box which they gifted me. Let me tell you, that is exactly what happens when you make this dish! 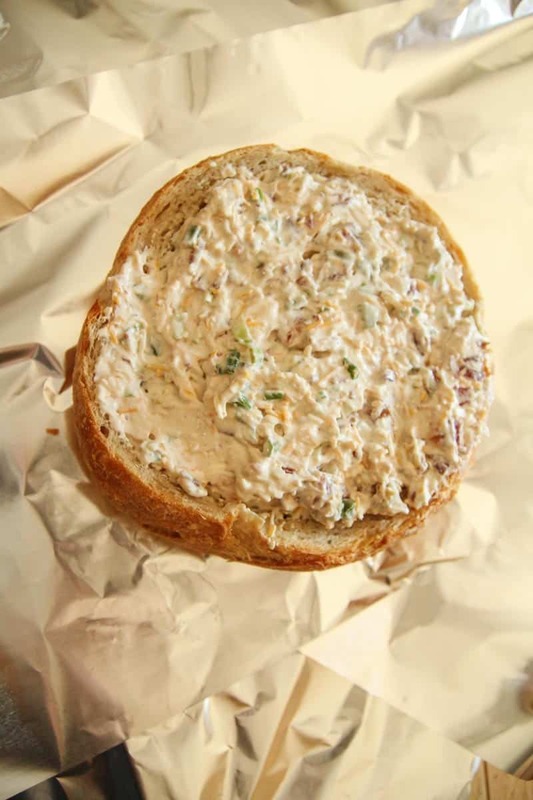 It’s always gone, even the bread bowl the dip is baked in gets broken up into pieces and eaten! 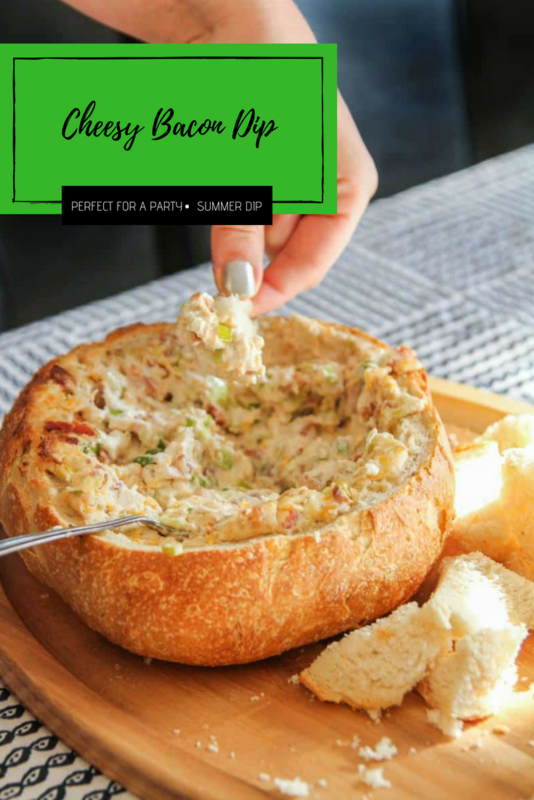 I cannot tell you how many times I’ve made this dip over the years, but it’s a true staple at parties and gets requested ALL the time!!! I would highly recommend making it for any and all parties you have coming up. this goes faster). Drain the grease from the bacon by draining/cooling the bacon on a plate covered in a few pieces of paper towel. 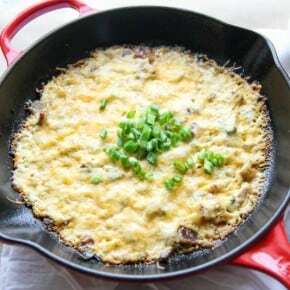 In a bowl mix together the cream cheese and sour cream until smooth, then add the Worcestershire Sauce and mix, then add the green onions, cheddar and bacon and stir until well combined. Hollow out the bread round (making sure to leave the bottom in tact) - I cut a shallow disc-like shape out of the top and the scoop out the sides by tearing pieces out. Set insides/pieces aside for serving. 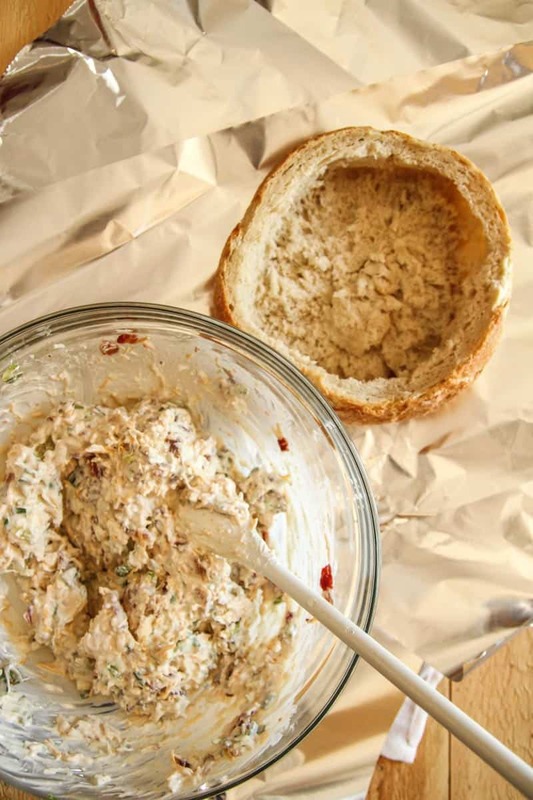 Place hollowed out out of the round bread bowl on top of 2 large pieces of aluminum foil that will cover the dip. 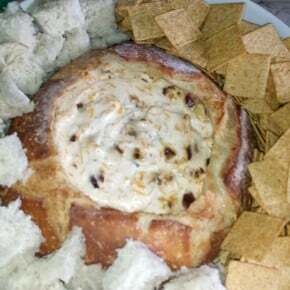 Spoon the dip mixture into the hollowed bread bowl, and then wrap with aluminum foil and bake for 45 minutes, remove the foil and bake for an additional 10 minutes. 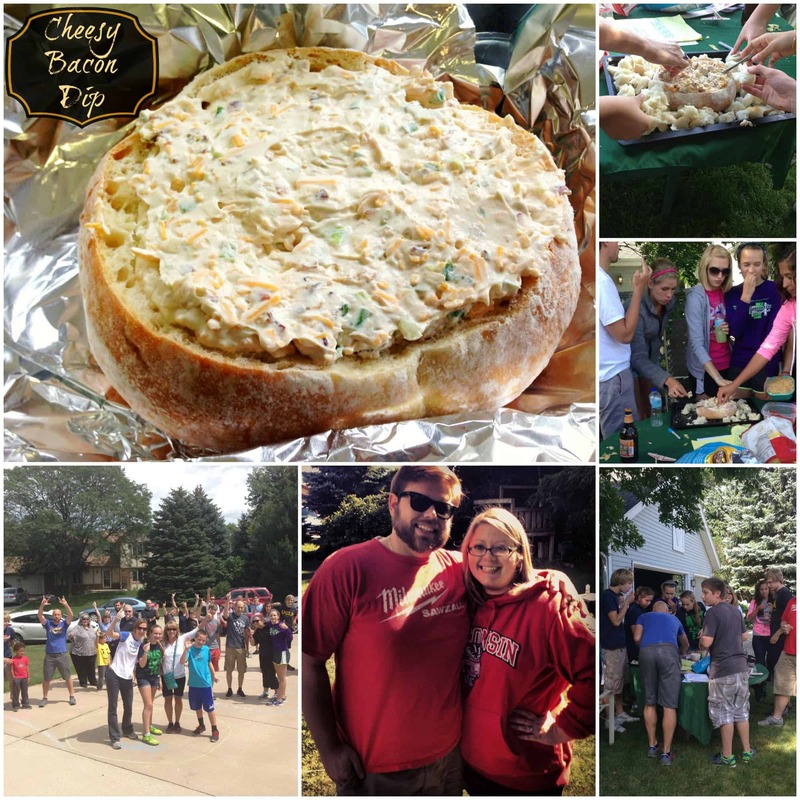 The Dip sounds awesome – but I also want to hear more about your amazing race! Sounds like a great family activity. 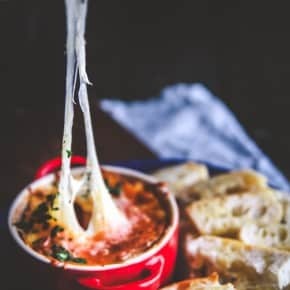 This cheesy dip is what I have been looking for, should be good to make ahead and put in oven just before serving. Thanks. Have you ever baked this ahead of time and just reheated it? I want to make it for work but we don’t have an oven here, just a microwave. Sorry only responding now (it’s been a crazy busy week). Yes, I have made the dip ahead and then reheated it in the microwave 🙂 I just serve it in a bowl and not a bread bowl if I’m reheating it. Haha, well said! I swear this dip is always the biggest hit at family parties. It’s always GONE! My husband said to me the other day “anytime you want to feel good about yourself, just bring that dip to a party and see how much everyone loves it” lol! I’d love to hear how you love it! This looks simply incredible. I’m serving this at my next get together. So happy to hear that, I think you’ll love this amazing dip!